When it comes to your teeth, you deserve the absolute best care possible. That goes double for when you require dental fittings, such as a crown or a veneer. Because those fittings are crucial to your well-being, you should have access to high quality custom made dental ceramics. And because tooth pain is excruciating, you deserve that care as quickly as possible. 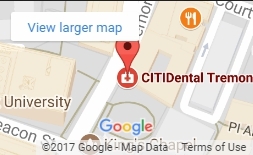 CITIDental offers Boston the best of both worlds, all from the convenience of our Tremont location, by using the CEREC method. Also known as the Chairside Economical Restoration of Esthetic Ceramics process, it is the industry’s only method of offering patients a single-visit application of crowns, inlays, veneers and fillings. Under normal circumstances, a patient needs an appointment to be examined and then, following several days for a lab to create a proper crown or veneer, must return to have their replacement installed. CEREC compresses that timeframe down to one easy visit, making that drawn out process obsolete by harnessing the latest dental advances. Using the power of CAD/CAM technology, CEREC is able to create an optical impression of your teeth and jaw by using a 3D camera. Using that optical impression, our staff then designs the perfect restoration fixture for your circumstances, taking into account your case details and your preferences. An in-office milling machine generates the ceramic restoration right there in our offices. Within 20 minutes, our staff has the perfect fixture for you and can install it right then and there. Your new crown, veneer or inlay will be constructed with the finest ceramic material, a substance that is both durable and also biocompatible with the rest of your teeth. The method also uses an advanced bonding agent that allows our staff to install your reconstruction with the minimum amount of existing tooth structure, which means that less of your natural teeth needs to be removed to accommodate the new fixture. This means the patient gets the absolute best possible fixture in the shortest possible amount of time. By using CEREC, our staff can help you with your dental replacement needs in a faster and more effective method than ever before. For more information or to set up an appointment, contact our Tremont offices right away.